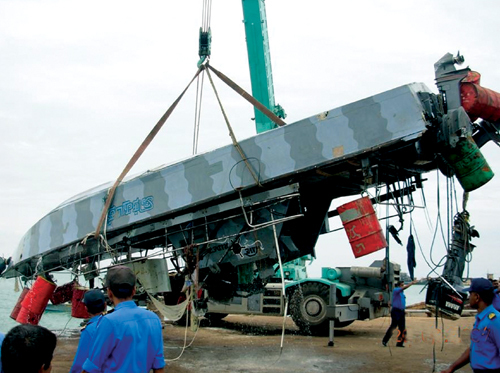 One of the LTTE command boats that capsized due to Naval fire during the sea battle being salvaged at the Kankesanthurai harbour last evening. Twenty four hour operations at the Bandaranaike International Airport will resume next month. The Sri Lanka Navy yesterday confirmed that more than 40 Sea Tiger cadres were killed and another 40 cadres injured as the Navy destroyed six Tiger boats in the battle that continued for more than five hours in the sea off Point Pedro on Tuesday.